To help you get started, we have put together a graphic tutorial to illustrate 8 easy steps to walk you through creating your first blog post from start to finish. 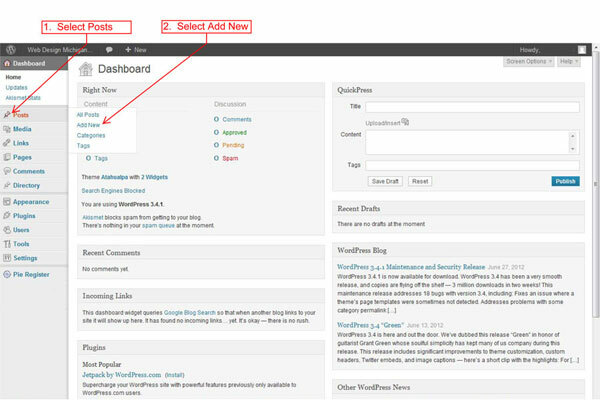 We have also included a few WordPress Posting Tips near the end to help you get off on the right foot. By following these steps, you will have a clear road map to guide you into the blogging world. After you have logged into the WordPress dashboard, locate “Posts” in the left column and click “Add New”. Steps 3 through 8: Follow the directions in the graphic below. 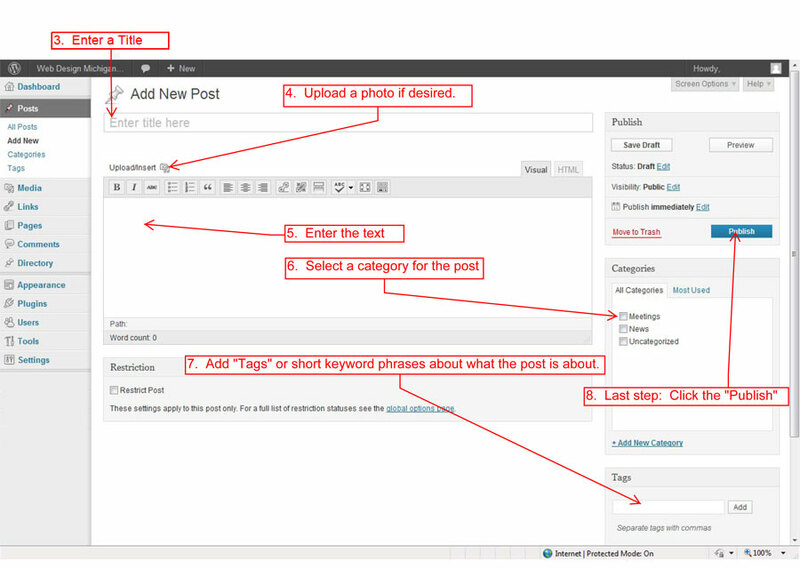 Make a Backup of Your Article: Compose the article for your post outside of WordPress. For an example, use Microsoft Word for the backup. This way, you will have a hard copy of the article in the event something goes wrong like a power outage. Imagine working on a 800 word article in the WordPress authoring text box and the lights go out. Inserting Images into an Article: You may consider entering the text in the text box and then insert the photo. Place your curser in the text body where you would like the photo inserted. Visual or HTML: When composing your article text, you have the option of choosing the Visual or HTML format in the composition area. If you do not know HTML code, you may want to use the Visual option so that you have a good idea of what the final post will look like as you create it. Bold Text: Highlight the text that you would like to bold and click the “B” or Bold button to make important text stand out. The “B” is directly below the “Upload/Insert” button. Please refer to the graphic below. Bulleted and Numbered Lists: Consider using bulleted or numbered lists for organizing important lists in your copy. Internet viewers tend to scan web pages rather than read long paragraphs of information. Place your cursor where you would like the bullet or number, and click the bullet or number list options. See the graphic below. Creating your first blog post in your new WordPress blog does not need to be an overwhelming process. We hope that our WordPress tutorial and these visual directions have helped you on your blogging journey. Please let us know what you think. 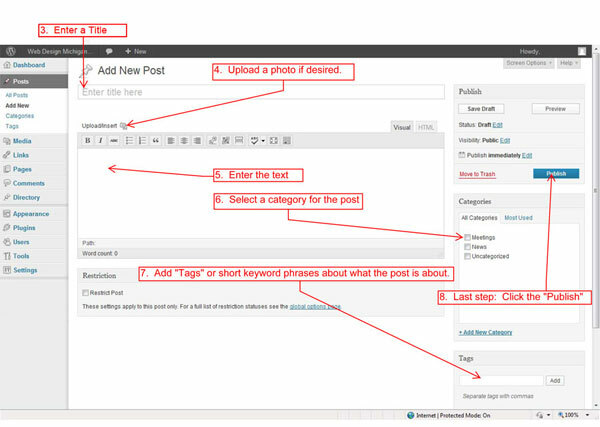 Clear easy to follow step x step guidelines and diagrams on creating a WordPress blog post. Anyone just starting to blog can use this tutorial! Thank you, Livvie, for your comment. We hope you will find it useful and will recommend it as a reference for anyone new to WordPress blogging. Great post. I just couldn’t figure out how to add a thumbnail to my name when commenting or replying to the comments. It’s not on the ‘Edit your profile’ group of things. Thanks. Thank you, Veronica. Are you referring to the avatar next to the comments? You can set up a customized image to use as an avatar at: https://en.gravatar.com/. Simply sign up for an account, upload an image to use as your avatar and associate an email address or addresses with the avatar. Whenever you post a comment with the associated email address on your blog or any other, the gravatar will show up. I do see it, Veronica! Great job!